Peter Higgs, Emeritus Professor of Physics at Edinburgh, was – finally – awarded the Nobel Prize yesterday. It was entirely expected, since his hypothesis – that there’s a subatomic particle called a boson – was finally proved correct in a (rather large) laboratory last year. People like to call Higgs’ Boson the God particle, which puts physicists in a flap apparently. 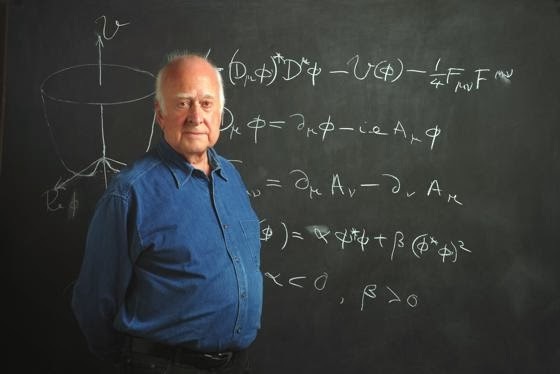 It’s nice that Professor Higgs is having his Uranus Return right now. His natal Uranus is at 10°27 Aries; and transiting Uranus is just 8 minutes from an exact conjunction at 10°19 today. 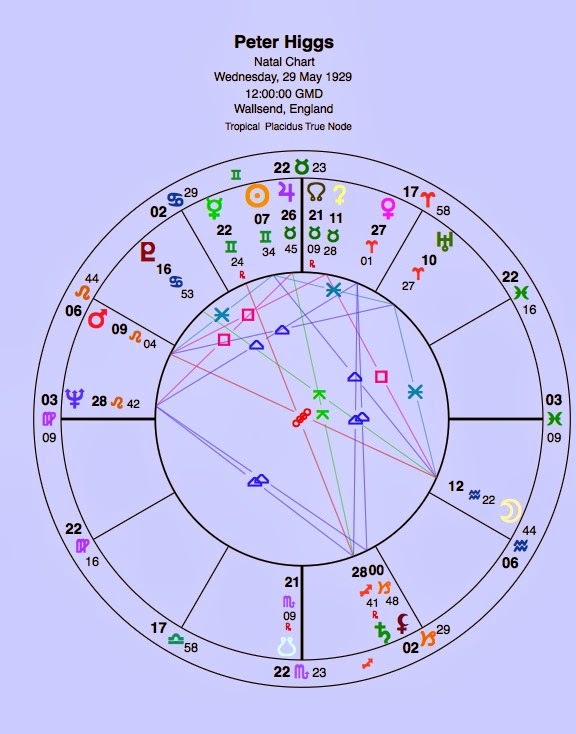 Transiting Pluto is 5° from an exact opposition to Higgs’ natal Pluto. Higgs along with several other scientists posited his theory first in October 1964. That was when the Uranus-Pluto conjunction of the 1960s was forming, Uranus was at 12° Virgo and Pluto at 14°. Today those two planets are coming to an exact square at 10°. And just to be even more symmetrical, in Higgs’ natal chart Uranus and Pluto also square (6° apart). So he was born on a closing U-Plu square, published his theory on a conjunction and won the Nobel on the opening square. Uranus is the planet of science, awakening and discovery. Pluto is the planet of subatomic stuff. Neat. I like his Neptune in trine to Saturn as well ! (Neptune very near to his ascendant). Oh yes. I think neptune/pisces is often very good at abstract thinking! But Saturn gives it discipline!